Who knew watching TV could save your life? The night before leaving on a cruise, Alisa Mari was trying to free up room on her DVR to record programmes she would miss while on vacation. One of the space-eaters was a talk show demonstrating how to perform CPR that she’d been saving for her husband, Andy. Just watch this so I can delete it, she said, and he did. A week later, their cruise ended in Miami, where Andy’s mom lived in a senior community. Alisa greeted her mother-in-law, then excused herself to visit the restroom. The next thing Andy heard was a loud thud. He rushed to the bathroom and found Alisa on the floor, foaming at the mouth. His mom’s apartment was equipped with an emergency alert cord; she rushed to pull it. Meanwhile, Andy checked for a pulse and found none, so he began chest compressions– using the technique he’d learned on the programme Alisa prodded him to watch the week before. Alisa suffered cardiac arrest, which essentially means the power went out in her heart. This is different from a heart attack, which is caused by blood flow to the heart being blocked. More than 350 000 people in the United States suffer a cardiac arrest outside a hospital each year. There are not definitive South African stats, but it is believed that our rate is amongst the highest in the world. If CPR is performed immediately, it can double or even triple the chance of survival. Andy spent about 15 minutes giving Alisa compressions. This kept blood flowing to her organs until help arrived. Paramedics took over CPR, then tried to restart Alisa’s heart by deploying an electric shock using an automatic external defibrillator. It wasn’t until they reached the hospital that doctors were finally able to stabilize her. A few days later, doctors placed an implantable cardioverter defibrillator under Alisa’s skin to shock her heart if it goes into a fatal rhythm again. Doctors also discovered a significant blockage in one of her heart’s arteries, so they inserted a stent to prop it open. Alisa was 44 at the time of her cardiac arrest in 2010, but was at risk for heart problems. She’d long been treated for high blood pressure and high cholesterol, and was a former smoker. She also has a family history of heart disease, including some relatives who died in their 40s from heart-related conditions. Alisa and Andy became advocates for wider CPR training. They also began participating in their local Heart Walk. They now live in Ramsey Springs, Mississippi, and own a convenience store. They keep a bucket on the counter collecting money to help fund CPR training classes for school bus drivers in the rural area. 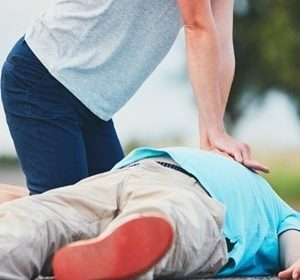 If you find yourself in a situation where someone needs CPR, we’ve included some practical tips you can use. C – Chest compressions. Place your hands, one over the other, fingers interlocked at the centre of the person’s chest. Position your hands so that the heel of your hand is making contact with the person’s chest. Press down on their breast bone continuously, to a count of one-two-three-four. Push at a rate of 100 compressions per minute. A – Airway. Open their airway. Gently tilt their head back to allow for easy breathing. Check for breathing. Taking note of the chest rising or breathing sounds. B – Breathing. If the person is not breathing, you have to breathe for them. Begin mouth-to-mouth breathing. Breathe gently into their mouth, closing their nose. Check to see if their chest rises. If the chest does not rise begin chest compressions again.